The Monastery of Saint Naum was founded by Saint Naum in 905 during the time of the Bulgarian Empire. Saint Naum was a notable writer and teacher during the medieval period. He was the disciple of Saints Cyril and Methodius who were credited for being the founder of Glagolitic and Cyrillic scripts. St Naum was also one of the founders of the Pliska Literary School. All through the 16th century, the monastery had a Greek school before which it was destroyed and remained in ruins till the 13th century. Today, the church is one of the prized possession of the region and is also one of the oldest monasteries you can find in this part of the world. Walk in to the see the beautiful frescoes that date back to the 16th and 17th century and rare Byzantine Greek etchings on the monastery walls. A few other Slavic inscriptions seen here are a rare find and it is believed that this is one of the earliest evidences of Slavic literature in the world! The paintings of the Balkans date back to the 18th century while the iconostasis that is carved out of wood dates back to 1711. However, the highlight of the place is the tomb of St. Naum. It is believed that if you rest your ear on the tomb, you can still hear the heartbeat of the saint! In its entirety, the monastery manages to spell a cast on its visitors- the lush green surroundings, the beautiful gardens where you can easily spot peacocks and the enchanting view of Lake Ohrid. Love this? Explore the entire list of places to visit in Ohrid before you plan your trip. Fancy a good night's sleep after a tiring day? Check out where to stay in Ohrid and book an accommodation of your choice. How popular is St.naum Of Ohrid? People normally club together Saint Demetrius and Bay Of Bones Museum while planning their visit to St.naum Of Ohrid. The boat tour through the river is a magical experience. The water is so calm and clean. The nature is well preserved. Very beautiful scenery. Easy stop on your way to the border. 50 dinars to park, lots of souvenir stands, and a few restaurants. There's a hotel on the property as well. It's 20 dinars to use the restrooms....just a warning. Other than that, it is worth seeing. Go to see that place. It is located on top of the lake. Beautiful gardens with peacocks in it. If you go by car there is a huge parking space for the price of 50 denars. There are several restaurants as well were you can eat good food but it is a bit pricey. Nevertheless the view is great. You can even have a boat trip or eat in the middle of the lake. 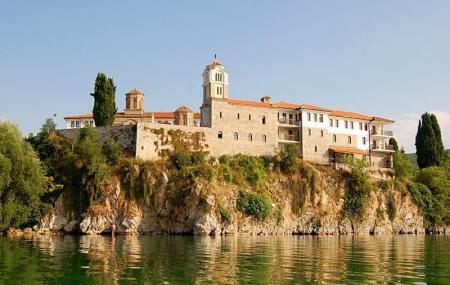 The most important landmark of the southern area of Lake Ohrid is St. Naum Monastery. All the constructions are very interesting. The church is surrounded by high walls transformed into monks rooms. The park surrounding it is populated with peacocks. You can find them anywhere, including trees or on the roof of the church. You can also admire some artesian fountains. Wonderful magical place. The hotel of the monastery kind of goes together with the whole scenery. Peacock song waking you up in the morning. Surrounded by mountains and some really amazing sunsets almost guaranteed daily. I enjoyed my stay here.